Posted on June 9, 2017 , in Hot Tubs. With so many shapes, sizes, and models on the market, choosing the best hot tub for you can be difficult. Among the many decisions you’ll need to make is deciding whether to invest in a portable or a permanent hot tub. Below you’ll find out about what to consider when deciding between these types so you get the hot tub that’s the right fit for you. Your home’s electrical system is one of the first things to think about when choosing between an in-ground or portable hot tub. 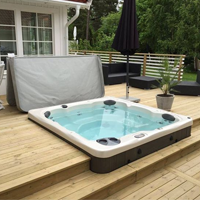 If you have accessible electrical wiring already installed on your property, a portable hot tub can be a good choice because you will easily be able to move it from location to location whenever you need or want to. With a portable model, you’ll have the freedom to place it closer to your house, on a deck or patio, or move it from season to season to create the perfect scenery for your soak. The location of an in-ground hot tub will need to be carefully considered since the location will be permanent. If you choose this option, make sure to think about both the aesthetic and practical aspects of the location. If you want to create an outdoor space that truly reflects your style, building a beautiful outdoor deck and landscape is essential. This often works best with a permanent, in-ground installation. Not only will you be able to design a space that complements your lawn and home, but permanent hot tubs come in many unique shapes and sizes to suit any style. When you have a strict budget, a portable hot tub is often the best choice because they are cheaper. One thing to consider, however, is the cost of designing a space around your portable hot tub. For example, if you decide to build a deck to make the hot tub blend in more with your style, you could end up spending extra money. Permanent, in-ground hot tubs also often cost more to maintain and run. While above-ground hot tubs cost between $20 and $30 monthly, in-ground models usually cost over $30 per month to run. Hopefully these tips will help you make the right decision for your needs, style, and budget. To find out more about in-ground and above-ground models, download our buyer’s guide.